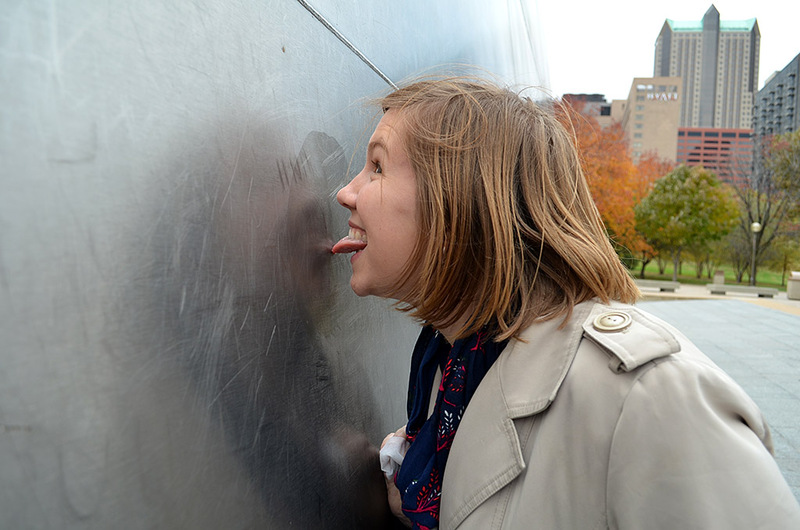 When Curator Jessica made her initial pilgrimage from Ohio to Missouri last December, I convinced her that every first-time visitor to St. Louis’ Gateway Arch has to lick the stainless steel icon. She was a mere child of 29 at that time, and gullible. U.S. Route 61 is the official designation for the highway that runs from New Orleans, past Memphis, past Cape Girardeau and St. Louis, ending up in Wyoming, Minn.This section through Arkansas was once a dirt trail called the North-South Road, and was in such poor shape that it might take as much as a full day to cover 15 miles. Highway 61 called the Great River Road because it parallels the Mississippi River a good part of its run. It also answers to the name “Blues Highway” because of the path it takes through Blues country. Now that she’s put 30 birthday candles in her back pocket and done several thousand Steinhoff Road Miles, Curator Jessica is older and wiser. She wasn’t falling for the old Lick the Arch trick twice. She did agree to risk death by posing under the arch so you could get an idea of its scale, roughly 15 feet high and 20 feet wide at the base. I didn’t realize until I was editing the photos that she DID fake an almost-lick for the camera. I guess that’s close enough. 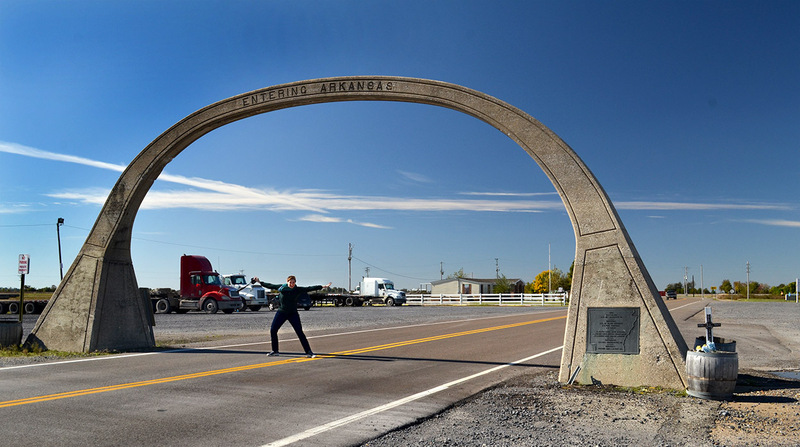 The arch was created by the Mississippi County Road Improvement District in 1924. 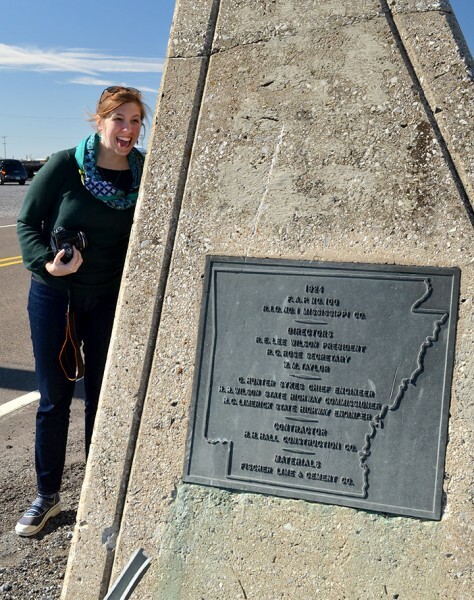 Check out what the National Registry of Historic Places says about the arch and what Arkansas highways were like in the first quarter of the 20th Century. It’s a fun read and will make you appreciate modern roadways. I love this part: The location of the arch on the directly south of the Arkansas-Missouri state lines had a somewhat strange economic effect. Highway 61 runs primarily north to south, but at the state line the road runs east to west for a distance of approximately one-half of a mile. The state line is located directly north of the section of highway. The murder of Brenda Parsh, CHS 1968, is the subject of tonight’s “Beauty Queen Murders” on the Investigation Discovery Channel. It will be aired at 10pm Eastern, 9pm Central and again at 1am Eastern, midnight Central. Local beauty queen Brenda Parsh is her hometown’s fashionista. When Brenda and her mother are murdered, the residents of Cape Girardeau, Missouri, are sent reeling. After another young woman is murdered, the town fears a killer is terrorizing their town. I can remember seeing this as a kid and thought it was long gone! Now I know where to go to see it again…south on 61 the King’s Highway to Arkansas! That arch was a regular point of passage for my family and me when we were living in West Memphis, Ark., and making regular holiday and vacation trips to my grandparents’ home in Cape in the 1950s and early 60s. (The smoke stack at the cement factory was the other, a signal on the northbound trip that we were almost at our destination.) From somewhere my sister and I picked up a myth that we had to raise our feet from the floor of the car when we passed under the arch, or something dreadful would happen. Knowing it still stands — that it can take a licking and keep on ticking? — draws me back to some awful and wonderful times. Thanks for sharing the photo. Found it by accident, driving around the country in 1988. Love to see things like that. Try to use the back roads to see unique things such as the arch.